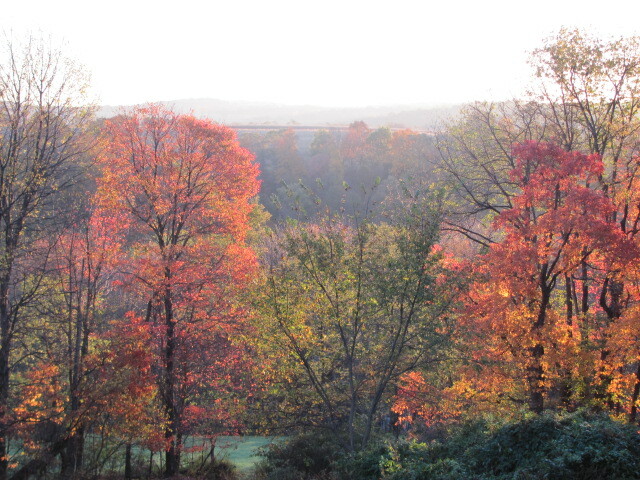 Wednesday (October 27) was a golden autumn day. 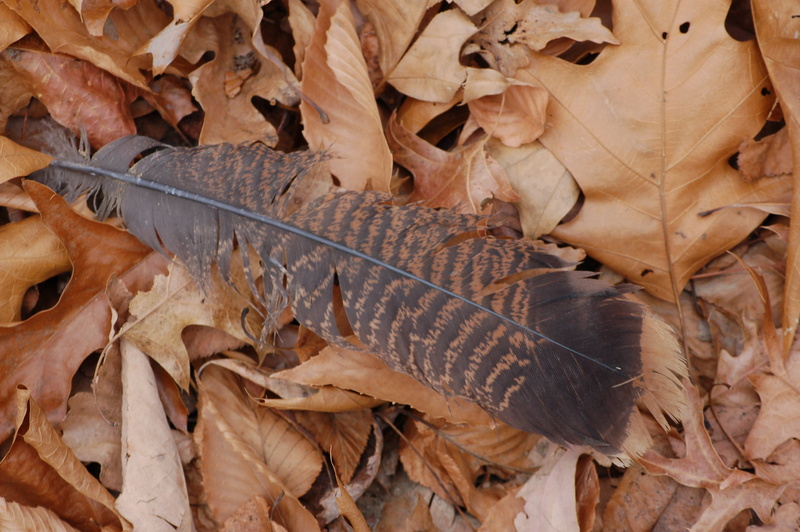 I needed two go for a walk for a number of reasons….excercise; enjoy the beautiful conditions; study sycamore trees and leaves for an upcoming painting; look for wildlife and take some foliage photos. I chose to walk very rural roads I know about where the existence of any vehicles is a very rare thing. The hike consisted of approximately 8-9 miles and was invigorating. I only saw several deer, various birds, a couple of red-tailed hawks and I heard a grouse drumming. 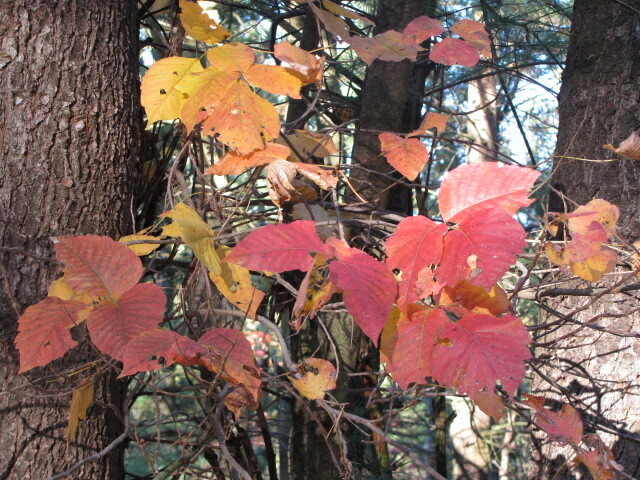 On Thursday (October 28) while visiting my mother I decided to go another hike. This was one of those 30 MPH wind days. On this venture, I was fortunate enough to see, at least five turkeys and watched two deer get up from their beds before fleeing. As I was walking along a field’s edge, I noticed what appeared to be a buck’s antlers. I stopped and reversed one step only to see a spike buck laying among the briars at about 18 yards. I tried to get focused photos, but failed to do so. 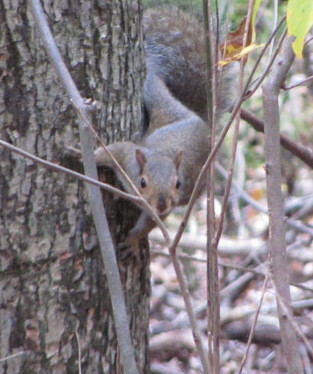 I eased up to a tree and look for clearer view only to spook him. The evening would be a few hours of fellowship with members of the church’s mens group. I was the speaker this evening. 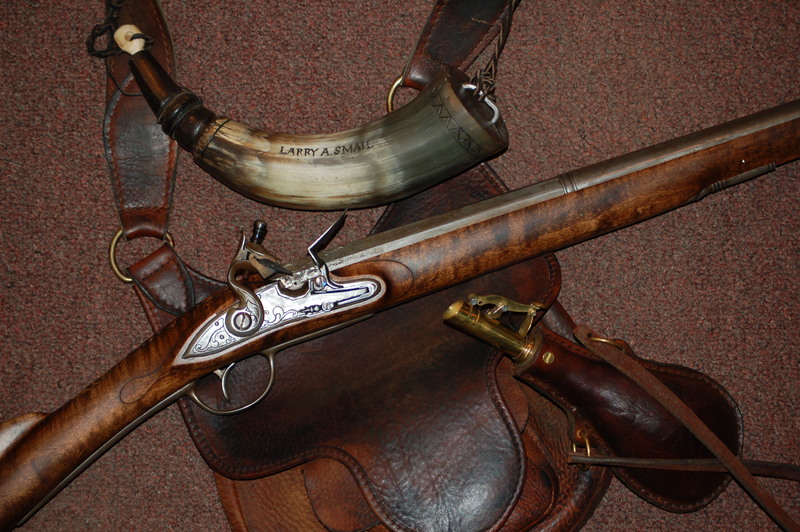 I dressed in my 18th century era apparel and carried along two flintlocks, tomahawks and other things of interest. The guys seemed to enjoy the historical (not hysterical)aspect of the talk and be able to see firsthand what a militia-member of that time period would have looked like. A great bunch of guys! The cough prevented me from going out hunting on October 22. This morning, however, after much thought, I left to pick up Bob around 8:30. I wasn’t coughing much at all. I heard a shot somewhere over the ridge. I thought maybe Bob shot. Just as reached the crest I noticed a deer standing some 35-40 yards from me. The doe was partially concealed within the green briars. I determined the head was free of a rack and shot. The deer ran off and I continued searching for Bob. We came back within minutes and I began a search for signs of a hit. I did see some blood and the deer again. I began a stalking style of hunting and saw the deer jump up and move ahead only to stop. I realized the deer was hit hard, but I knew what I needed to do too. I continued the stalk until, finally, I connected. The deer was a button buck. 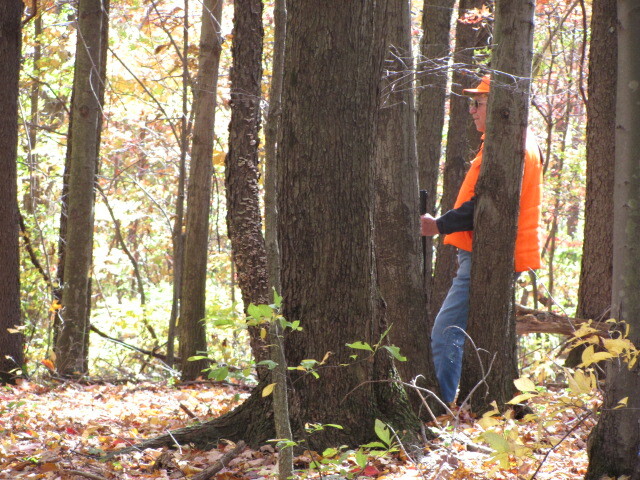 I didn’t know that until the hunt was over due to the amount of briars and tree-tops over much of the area. The smoothbore I have works flawlessly. It is a gun of high quality. Me, on the other hand, have difficulty using it at times. The muzzleloader has a front sight only. I need to take that sight and keep it low along the length of the barrel. This causes me to see a blurriness and a hazy shine on sunny days like today. I am certain our forefathers experienced such problems as , they too, aged. A fact: vision just isn’t as good as when they or us today get farther along in years. Despite my lingering health issues with coughs I elected to try to push a deer past my step-father Bob. We saw a lot of deer in the four hours we were out hunting. The irony of hunting is how the best opportunities today were buck. We both had close encounters with more than one buck deer. We saw turkeys, lots of squirrels, groundhogs and of course a number of deer. Around noon I noticed a deer getting up from its bed. The animal, at about 30 yards, actually fell in its haste to get going. I immediately noticed a second deer. Instantly, I pulled “Jeremiah” to my shoulder and shot before it too got traction to speed off. I knew, at the shot, I had missed. I failed to place my cheek tight to the stock causing the front sight to remain high along the barrel. A high-flying lead ball would be the result of my haste. I guess that is why they call it hunting and not getting. After a lunch, I decided to not go out again and try to get some rest. Maybe tomorrow will prove to be a better day. Also, I found a weather balloon and mailed the weather measuring device back to Missouri. I have found several over the years in such a manner. Yesterday, on Tuesday morning, I had a sore throat. I went hunting deer anyway. This tends to my nature…avoid sickness whenever I can and hunt! 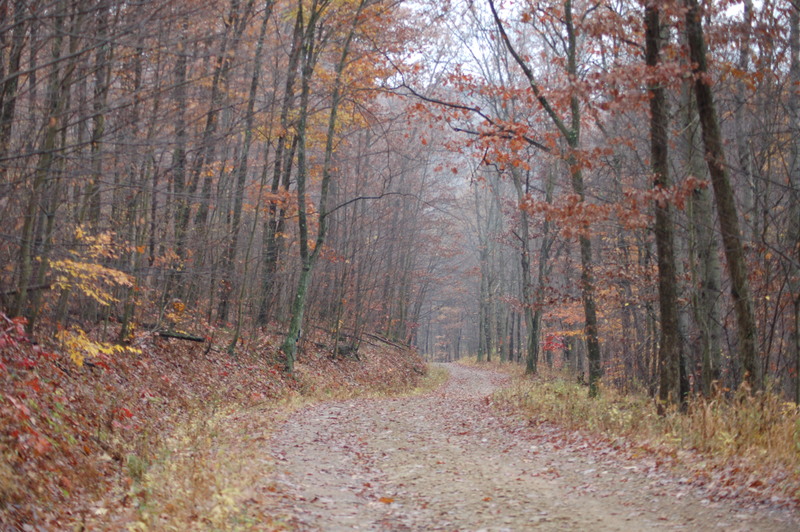 I did see 9 or 10 deer including a small buck; couple of turkey flocks; red fox and a bunch of squirrels. However, I decided to quit early because I feared getting a deer and having to drag and butcher this evening. 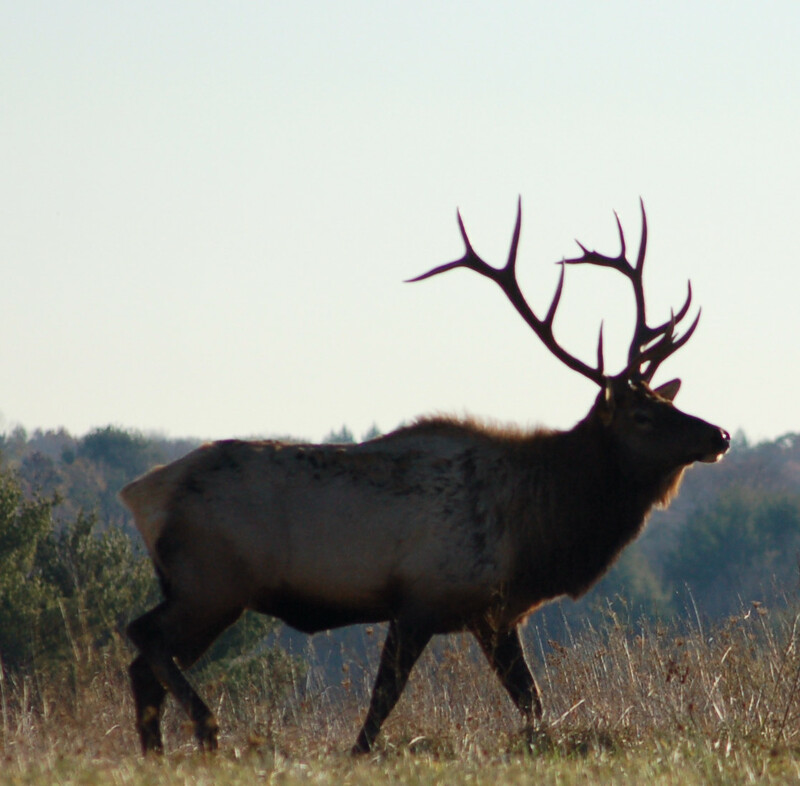 Also, I had plans to go to Elk County to see the elk. I knew I would need rest to try to beat this sickness. My mother-in-law, Anne Craft had never been to the area and made comments she would like to see the elk. Thus the plans were made. This morning, I didn’t feel all that bad, so the plans were carried through despite my sniffles. 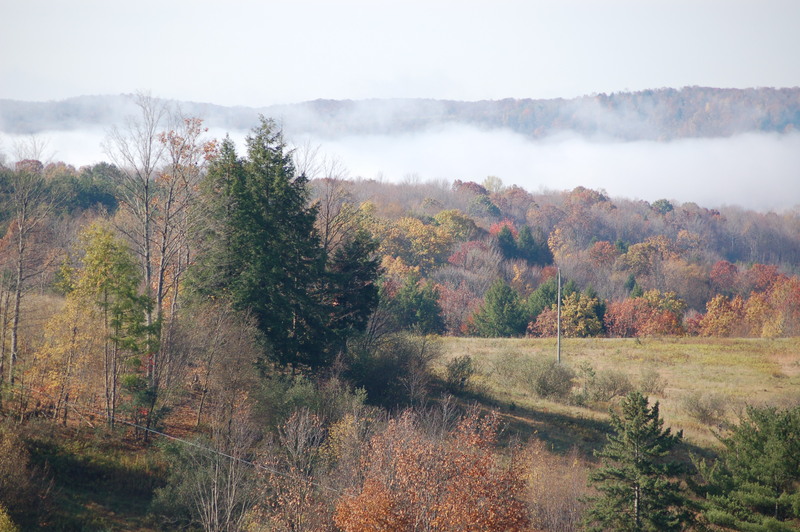 North of Dubois, Pennsylvania, I was quick to see the fog problems. Fog was present for the entire trip to Winslow Hill. Because of the fog, we went to the new Elk Center. Here we had time to look around, see a movie (where snow falls onto the viewers) play on interactive wildlife screens and walk some trails. After the movie, I was surprised to see how much fog had lifted. We went onward to viewing sites. The elk were, by this time, nestled in their beds dreaming of whatever it is elk dream about. All told, we only saw around 10 elk. Most were cows, one bull and another that was screened behind brush. Size and actions of the others indicted that this elk was, probably, a bull too. 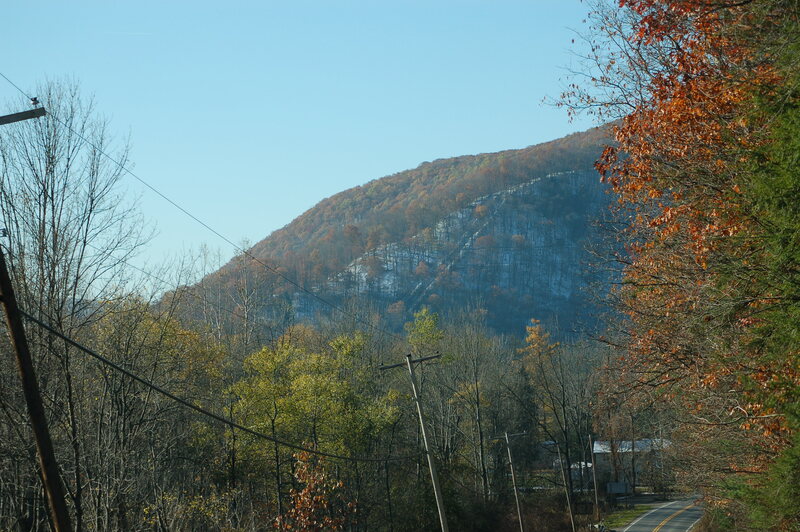 We did see the beautiful mountain range. I had always wished I settled in up in those parts. Those sights alone are worth the time. 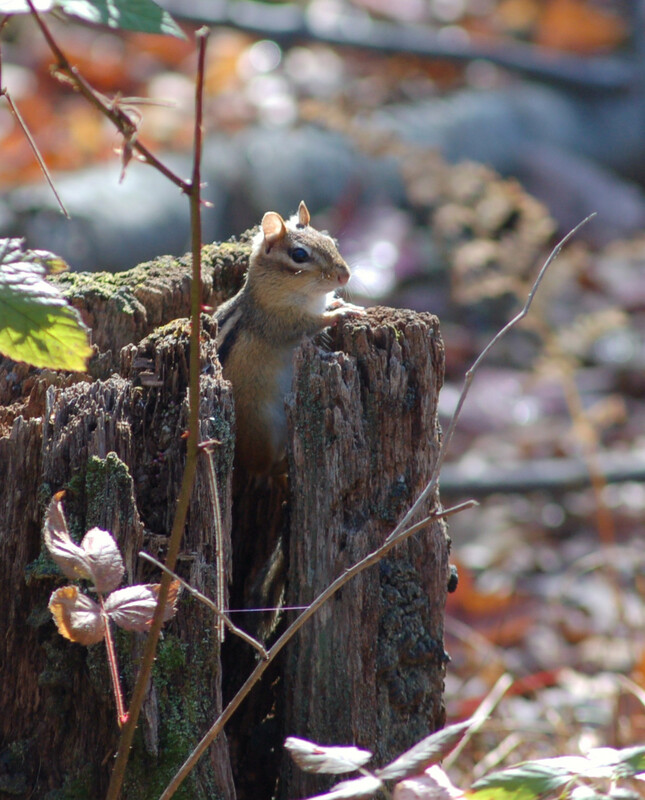 We saw two flocks of turkeys; two deer; a hen pheasant and this interesting little fellow in the photo. Anne felt blessed to see some elk and we enjoyed her company. She even bought our lunches! The second day of the early muzzleloading deer season and what a great day it turned out to be. “Jeremiah” and I had hoped on making venison this day. The deer sightings were numerous. I saw, at least, three, maybe four, different bucks. One sported two tines that were about three inches each. 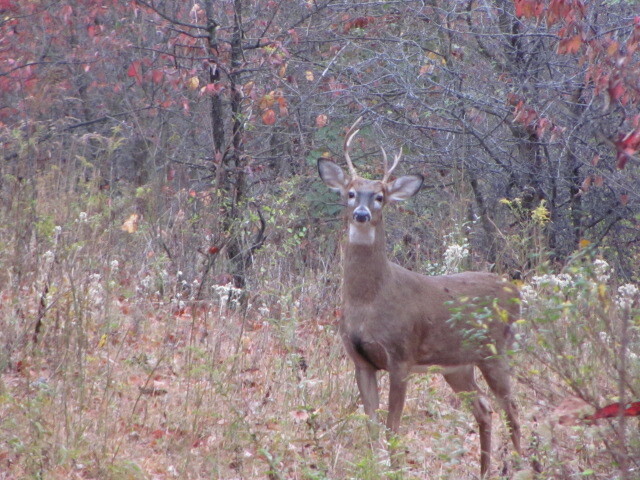 This buck would have been close as being considered an antlerless deer by Pennsylvania Game Commission laws. I didn’t take the chance. Oh, by the way, “Jeremiah” is my .62 caliber smoothbore French Fusil. I limit my shots to under 60 yards. 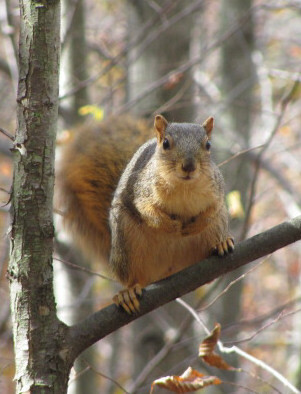 I saw numerous squirrels..grays, fox and pine squirrels. I saw and heard turkeys. The big birds did a lot of yelps, cackles and some gobbling for about 45 minutes. I, also, watched a red fox sneaking through the woods. Although, I made the claim that this day was to be deer day I failed to connect. However, that failure was due to my decision to hold off. I had a doe approaching me head on. I was cocked and aimed. I decided I would allow the deer to turn broadside. I feared the head on shot could damage some valuable meat if my shot veered to the side some. That decision soon made reality of a humane kill null and void. 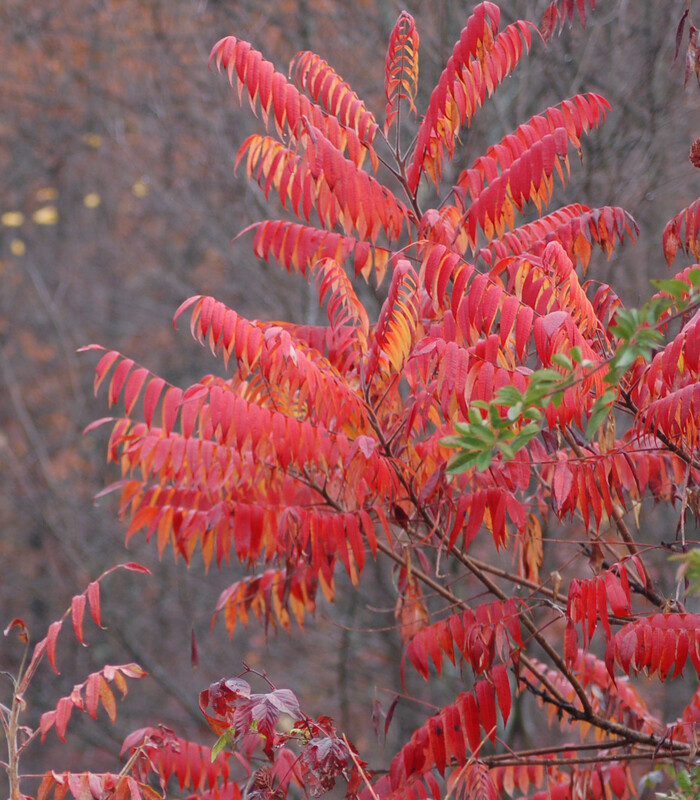 The deer sensed or smelled me at about thirty yards, snorted and leaped into the goldenrods. However, that decision not to shoot lead to my surprise of the day! 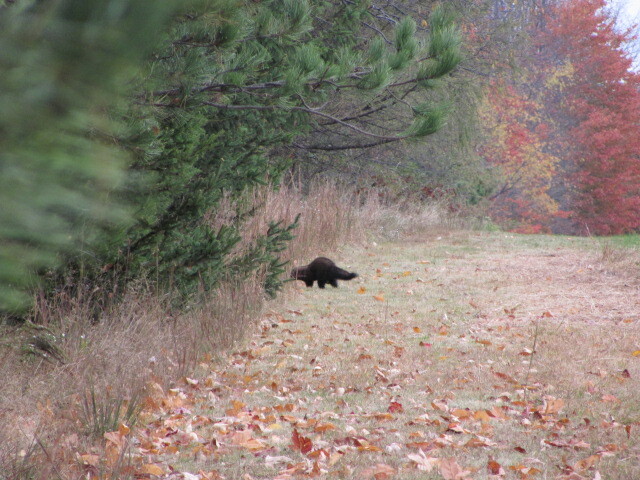 While walking along a field’s edge something walked out from the spruce thicket. 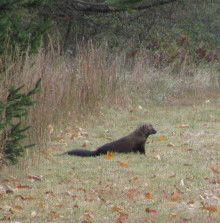 In short order, I realized I was gazing upon an animal I never thought I would see in Pennsylvania… a FISHER!! This specie was exterminated years ago mainly from the vast clear cutting of Pennsylvania’s forests during the 19th century. The game commission restocked them ten or so years ago. the mammal is, indeed, making a comeback! I waited for the designated time and Bob, my stepfather, hadn’t arrived for our Cherry Run hunt. He was having a problem with his flintlock and apparently didn’t get a remedy. The pre-dawn darkness was not without some pleasures. I heard two great-horned owls (later saw one) and a screech owl. I saw three deer in this part of my hunt. One was a small-racked buck. While I cautiously walked about I hoped to hear some turkeys on the roost. This was my primary reason to be hunting deer this day at this area. I pondered if I would shoot a doe this day.I play this game every year for a time. I enjoy the hunt and challenges, but the removal of a deer terminates this anticipation. This is difficult for a non-hunter to understand. I decided a shot would happen only if the distance of 30 yards or less appeared. During this morning jaunt I saw many squirrels, some grouse and some turkeys. I would see my first junco of the winter season. My records show this little “songbird” usually appears about the middle of October. 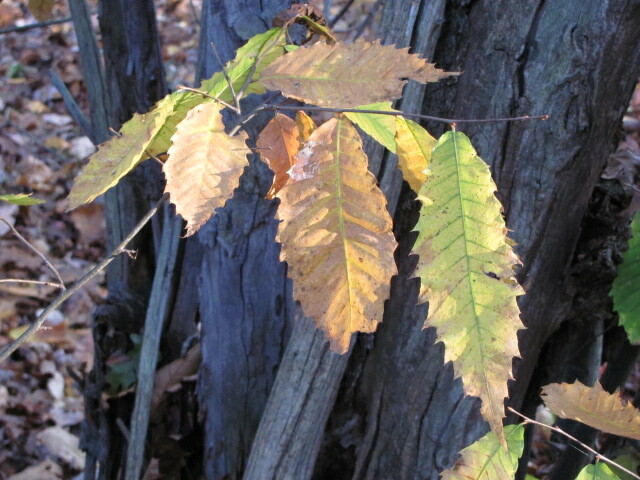 I always check out the American Chestnuts on the ridge top. My father introduced me to the trees, sometime, back in the 1960 time slot. He explained the killing 1904 blight to me. He remembered seeing big dead chestnut trees back in the latter 1920 and early 30s. All these years later they still live and grow to a height of 20-25 feet and succumb to the blight and the cycle continues. I quit the morning hunt at 10:20 and headed to see if we could get Bob’s firearm working again. We did! The lead ball was placed into the barrel and became stuck. There was no powder in the breech. We removed the touch hole and added powder and shot it out after attempts to pull it out failed. After lunch, Bob suggested going back out for a little. I obliged. 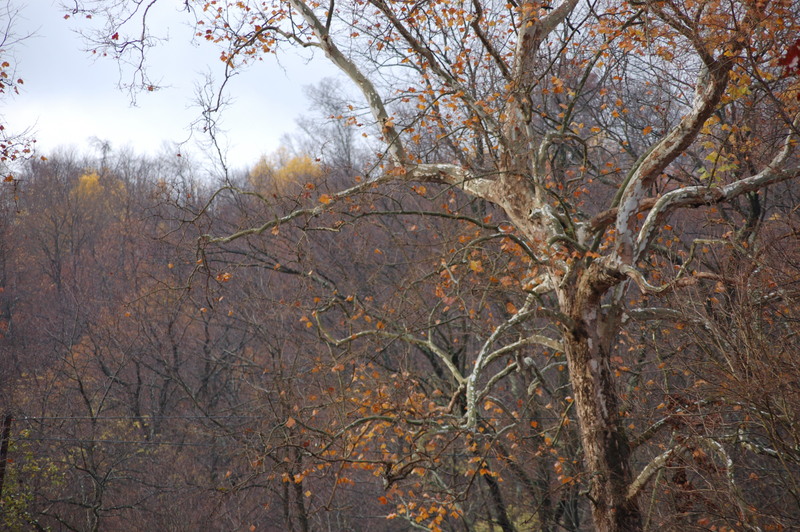 In the Blose Hollow area of Armstrong County, I saw 7 more deer. I almost was able to shoot at a bedded down deer. I saw more grouse and squirrels. We quit at three in the afternoon. I removed and terminated about 12-15 ticks from my clothes. Watch for them! 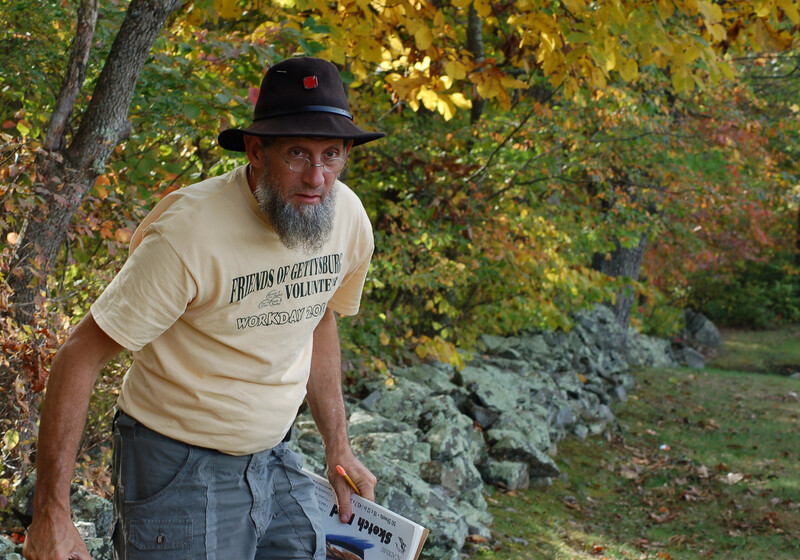 On October 11, 2010, my friend Bob (Slim) Bowser and I visited Gettysburg. The primary reason for the visit was to view, study and photograph the area of the battlefield known as the “Wheatfield” or the “Whirlpool of Death”. This battle was on July 2, 1863. 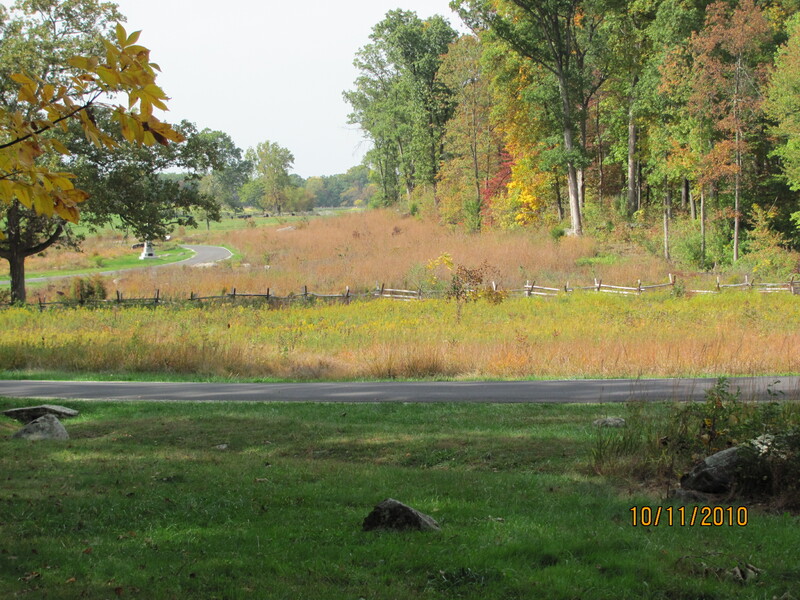 From the photo, the area with goldenrods and high grasses was, at that time, actually a wheat field. The tree vegetation area had been timbered This site would have been young trees left over from lumbering in the past. 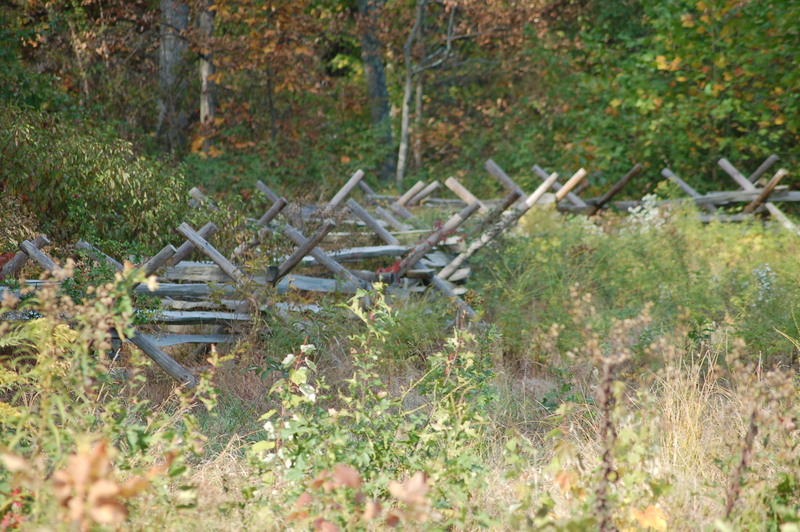 The fence was there during the battle. 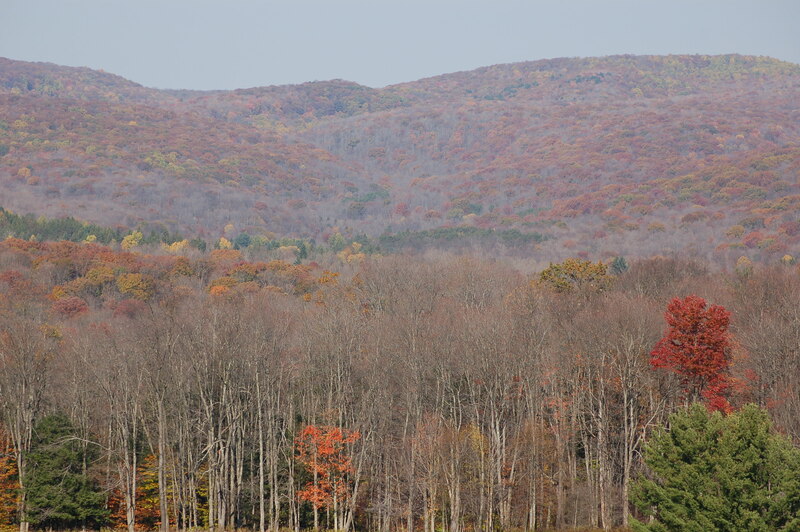 The distant ridge had Confederate artillery. 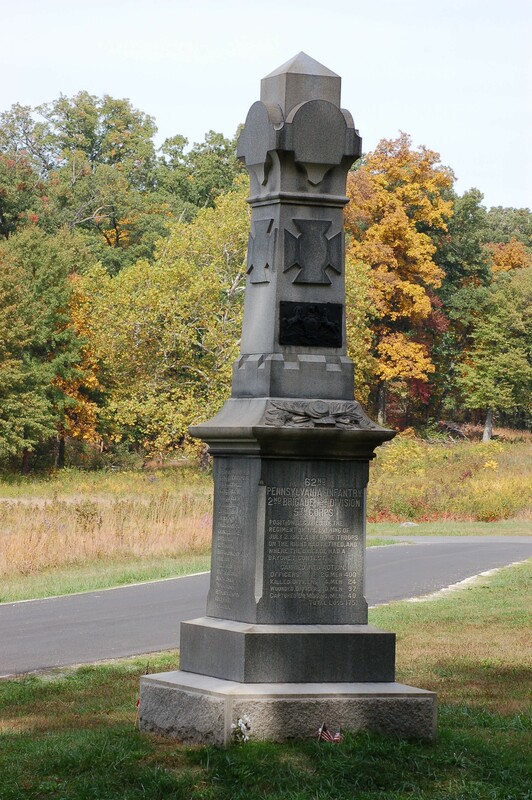 Monument to those of the 62nd. The site is currently being organized within my feeble brain waves for a painting featuring the site and the battle. Looking at photos do not make it as an artist attempting to paint such a scene. Firsthand viewing is a must, in order, to capture the magnitude of the area in paints. After sketching and discussion, we have decided on a preliminary concept as to what will be painted. 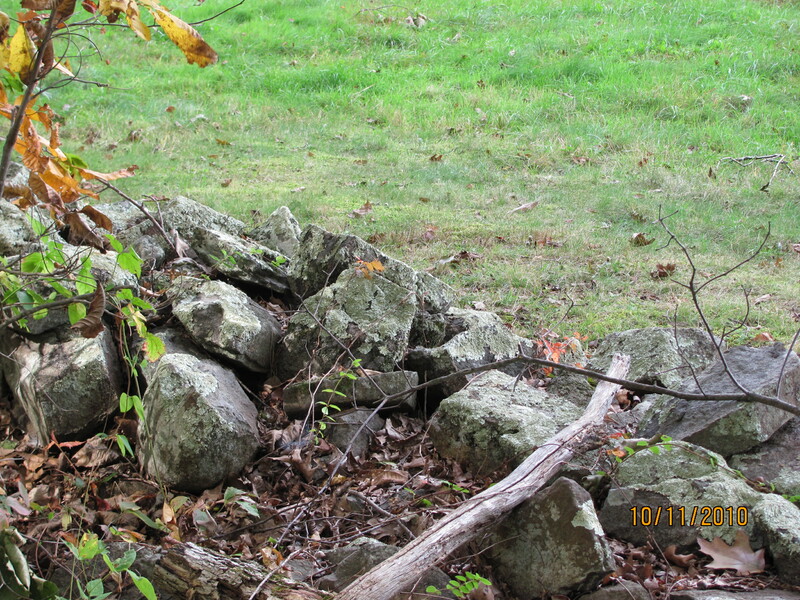 The view will be from the edge of a wood lot from behind a stone fence looking straight into the Union forces. The timing of the painting is to be at the time when it is realized that Confederate firing is coming , not only from the wood lot of the viewer, but from behind the force. The wood lot behind the Union troops is known as Stony Hill. The Union force in this painting is directly involved with history from Armstrong County, Pennsylvania. They were the Company D of the 62nd volunteers. They we mustered into service from Armstrong; Clarion; Allegheny and Blair Counties. The horror of war can be read below. The total of the 62nd was 1600 men with 744 casualties. Died in action: 164……wounded in action: 503 .. died from disease: 77. 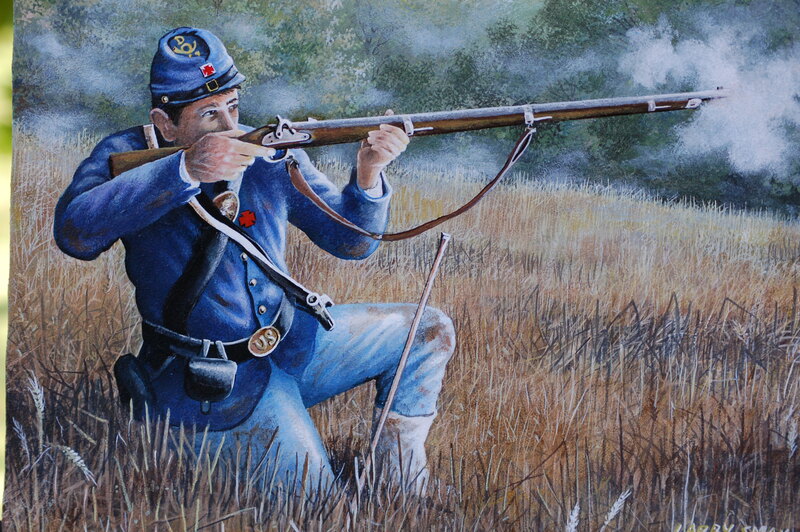 The mini-painting depicted here is of a union soldier firing. (The photo was taken with natural light and the colors are not true.) The actual painting to be completed is a challenge for me. Much time is going to be utilized to plans; sketching to finalize then positioning of the soldiers. More time is going to be used in painting. Wish me luck!!!!!!!!! !